The stability of a society and trust that can be placed in its institutions depends on the rule of law being upheld – as against the rule of men, which will vary from time to time according to their whims and fancies. Whether it is with regard to the security of private sector investments or a sustainable solution to the ‘ethnic conflict,’ there’s a need for stability whereby agreements made one day aren’t overturned the next depending on the will of one person or party. The importance of the judiciary in upholding the rule of law and constitution is apparent in the debate regarding the possibility of former President Mahinda Rajapaksa contesting the next presidential election. This unexpected resurrection of Rajapaksa’s hope to be a third term president has taken centre stage in the political debate. It also highlights the vulnerability of the rule of law. A memorable phrase of the Lessons Learnt and Reconciliation Commission (LLRC) appointed by the ex-president – to cope with the international demand for accountability for alleged wartime violations of human rights – was that the rule of law rather than the rule of men should prevail if past tragedies were not to repeat themselves. But to politicians whose quest for power is unlimited, such principles of democratic governance may be dispensed with as and when the need arises. The possible resurfacing of the former head of state as a presidential candidate occurs at a time when there is lack of clarity on both sides of the political divide with regard to who might be their candidates at the next presidential election, which is due no later than November 2019. On the government side, there’s no definite indication as to whether President Maithripala Sirisena will be the common candidate (as he was at the 2015 presidential election) or if it will be Prime Minister Ranil Wickremesinghe who has been the United National Party’s (UNP) main aspirant for the post since the 1999 poll. This issue of who will be the next presidential candidate has been left unresolved from the very beginning of the incumbent government’s term of office. It is the elephant in the room that must be taken into consideration if the government is to resolve its internal conflicts. Moreover, this issue has been at the root of the problem that has prevented the government from acting as a cohesive administration with a two-thirds majority in parliament. As the election draws nearer, the opposition will seek to capitalise on this failure of the government and its inability to act powerfully, to deliver the necessary benefits and economic development to the electorate to obtain their vote at the election. The opposition brought this weakness of the incumbents to light at the local government elections earlier this year when it trounced administration parties in most parts of the country. On the other hand, the government’s true strength, which is also in the national interest, is that the two-party alliance of the UNP and Sri Lanka Freedom Party (SLFP), and further engagement with ethnic minority parties, is essential if there is to be a political solution to the ethnic question – the country’s long unresolved problem. Until this is resolved, Sri Lanka will remain a divided polity although united in territory by the strength of its military. The ground reality is that the SLFP is a mere shadow of its former self with the bulk of its active members now with the Sri Lanka Podujana Peramuna (SLPP) led by the former president. But it can muster the support of a large number of voters who, when added to the UNP votes, will offer the two parties a strength that neither can muster on its own. If the reemergence of Rajapaksa’s candidacy galvanises the government to resolve its own issues vis-à-vis facing the next presidential election, then the national interest will be served. The country needs unified governance where there’s cohesive decision making with the rule of law being upheld. In 2015, the combination of Sirisena and the parties that now constitute the government was sufficient to assume power. 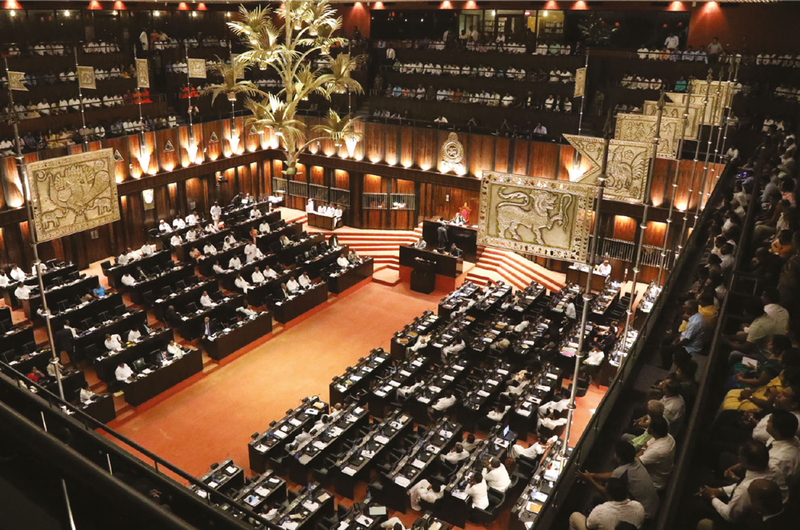 The government parties joined forces because they felt that they could not individually take on the former president and the political machinery at his disposal. When there is no clear choice of candidate for government parties as is the case at this time, the tried and tested formula of a common candidate might be the best to adopt given the absence of viable alternatives. The elephant in the room may no longer be ignored.